I’m making a lot of trips to Connecticut these days, to visit elderly parents. In so doing I’ve discovered a quaint corner of coziness called The Bee and Thistle Inn, a B&B and a comfort zone in Old Lyme that is my new favorite home away from home. The inn dates back to 1756, and when you show up, fresh (well, not so fresth) from a crowed Amtrak train, you are greeted with much warmth by the staff who will show you to one of only nine rooms—a tenth room reserved for spa services—and then suggest you visit the bar for some chowder or a fiddlehead fern salad or a cocktail. If you are me, you get all three, and you discover that the chef knows what he’s doing. It’s delicious stuff. 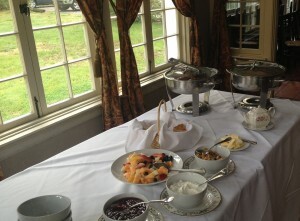 After a really good night’s sleep (due to peace and quiet and fresh air) you go downstairs for breakfast in a pretty dining room, where you find scones and fruit salad and granola and bacon and French toast, all home made and very fresh. At this point you are inclined to tear up that Amtrak return trip ticket and move in. If you find yourself in or close to Old Lyme, Connecticut for any reason I strongly encourage you to visit the B and T. Stay for dinner and/or the night. Charm is guaranteed. Caveat: no TV, but plenty of free Wi-Fi so bring your Hulu if you’re an addict. 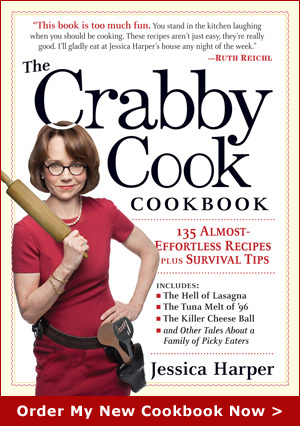 This entry was posted on Monday, May 20th, 2013 at 10:16 am	and is filed under Breakfast, Cool Products, Crabby Cook News. You can follow any responses to this entry through the RSS 2.0 feed. You can leave a response, or trackback from your own site. Sounds glorious. I hope your parents are OK. This place sounds heavenly, I hope to go someday. Thanks for the information and the picture.